Fold It is a science-based puzzle game developed by biochemists. It is basically crowdfunded science–anyone can play the game; and, by completing an increasingly complex set of protein puzzles, you are contributing to ongoing scientific research, that can lead to the possible cure of cancer, AIDS, and many other diseases. We will use this game to study properties of proteins, how they behave, and the mechanics behind the chemical interactions that make them possible. The first thing we have to do is to download the game here. (Keep in mind that Java applets have to be updated for the game to work on your device). After downloading the file, create an account. Once the account has been created and you are logged in, click this link, which is the group page of this lab; here you will click on ‘request membership‘. I’ll keep track of your progress in the game as an administrator of the group. The assignment will be completed once you unlock four achievements: sidechains, backbone packing, hydrogen bonding, hydrophobics and hydrophillics. During the course of Biology Honors a couple of years ago I first understood the importance of proteins. Since then, I have “over ranked” the importance of this molecule. Although my perspective on the role of proteins was not completely incorrect; this year in AP Bio while looking in depth at the different macromolecules and their roles, I have come to the conclusion that although proteins are crucial for life they cannot be prioritized nor “ranked” above any other macromolecules. They are all of equal importance because without one of them the others would not work. Besides, a recent study, done by the European company Volac, calculated that the typical human body is 17% proteins and 17% lipids. I’m convinced that the most important lesson a Biology student from any level should take from semester I is that proteins are VERY important. That’s the whole point of having cells. But we cannot do much with proteins unless we have other macro-molecules helping. After completing all of the required achievements, I felt happy because I knew that by completing some puzzles I might contribute to the cure of some complex diseases. Like open access peer review, this method of exchange between common people and scientist is incredible. Thanks to this type of technology people that have little access to information can obtain more information with the help of the Internet. This game aids both the people who play it and the scientists who receive the data. The players of this game will have further understanding of how a protein works and why is a protein important. Knowing why a protein is important for life is a very imperative lesson that Biology is responsible to teach. For a video of why are proteins important in our health, click this link: https://youtu.be/zxWbwNtWFik. I suggest you do research on a supercomputer named Titan. It is being used to predict protein configurations. If you like Minecraft, Google search for the protein game that is available, free of charge, from this video game. This game has helped me realize the importance of the shape of a protein. If it isn’t shaped the right way, it wont work as intended. For example, sickle cell anemia is caused by a protein called hemoglobin is shaped into rods instead of discs. This makes the shape of red blood cells into a sickle shape that has more chance of blocking blood vessels by sticking to the walls of the vessel. While scrolling down the blog posts I found one that looked familiar, and when I read it, it turned out to be the Fold-It game from class. I read the post and started the game thinking it was going to be easy, but it really wasn’t. Playing the game got me thinking that proteins are extremely complex macromolecules and are vital for life to exist. Proteins are the polymers that I find the most interesting because they make up most of an organism’s structure while still being the one responsible for the function of the chemical processes in an organism. Even more amazing is the fact that you can see that even macromolecules are interdependent of one another. Carbohydrates are used to store the energy to be used by the proteins, lipids, such as phospholipids, are used in cellular and organelle membranes to separate organisms from the outside world, and nucleic acids are the ones responsible for being the “blueprints” to make the proteins. This game has reminded me the importance of the protein and and shown me that you can make a difference by playing games and having fun. Check out the Titan supercomputer. This machine is doing a lot of cool things in regards to protein structure. The computer Watson, by IBM, is also being used to predict possible proteic configurations. 1. Hormones. Many of the hormones such as insulin and progesterone are proteins. 2. Oxygen transport. Hemoglobin, a blood protein, carries oxygen to the cells. 3.Cellular repair. Heat shock proteins help rebuild our cells after stress. 4. Binding and transport of nutrients. Transferrin, metallothionine, ceruloplasmin and other transport proteins bind to minerals and other things, and carry them throughout the body. 6. Movement. Muscle protein (such as myoglobin) is responsible for our ability to move. 7. Holding genetic information. Proteins such as RNA (ribonucleic acid) and DNA (deoxyribonucleic acid) in the nuclei of our cells are responsible for the genetic code. 8. Structural proteins. Proteins are also essential for the body structure. Bone consists of a protein matrix that fills with calcium and other minerals. Other structural proteins include collagen, cartilage, elastin and keratin that form the skin and other structures. 9. Enzymes. All enzymes are proteins. Thousands of enzymes facilitate every chemical reaction in the body. Conversion to fuel. Proteins may also be converted to sugar or fat to be used as fuel for the body. This is not ideal, but it does occur in some people. This game has helped me understand proteins while having fun. 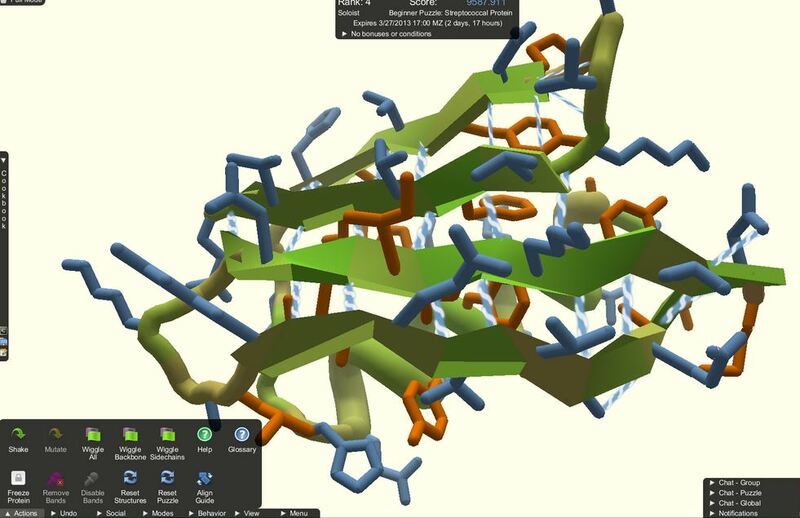 I got to understand more about amino acids and proteins by playing Foldit. The game was very challenging because you had to move proteins a certain way and know which position it must go. Thank you for telling us about this game because it helped me understand it better plus one can contribute to science and help find a cure for a disease. In 2011, players made a scientific breakthrough for the cure of AIDS that scientists had never been able to solve. Maybe one of us in Cupeyville School will help in science and make a contribution. The link below shows more information about the scientific breakthrough of AIDS. I enjoyed this game very much because it is not a mindless game where you basically play it just to entertain yourself. It is entertaining but it is also educating. It helped me understand more about proteins and hydrogen bonds and basically all the different structures of proteins. I found this article that said that gamers have solved the structure of a retrovirus enzyme whose configuration had stumped scientists for more than a decade by playing Foldit. So, not only iso it educational and entertaining, but it also helps in scientific discoveries that otherwise could have taken us years to discover. Fold it is a great game, it demonstrates the advances in technology. We have managed to create a virtual protein and we are able to interact with it. The game shows entertainment but also contributes to helping fight many diseases. A computer may be able to do thousands of different patterns but they can only get so far while humans can do more and give more variety as we are all different. Creating many types of possible folds. I tried the game and considered a fun and entertaining thing to do while learning several ways in which I could fold the protein in order to progress. At the end of the day things like this will allow common people and people not exactly interested in science to contribute and get involved with scientific progress. This game is very educative, but at the same time, very entertaining. It’s fascinating because it puts your analytical and problem solving skills to the test. I learned more in depth how proteins have to be arranged in order to function properly. Otherwise, you had to rearrange the protein because it was falling apart. As you went through each level, the game presented you very unique arrangements that you had to form, simulating the variety of unique proteins that we find in organisms. After you reached the end of the tutorial, I found it very interesting that there was an area dedicated to forging proteins where your designs contributed to the scientific community to see if your ideas could help in research.